Hidroksizin (Vistaril, Ataraks) pripada prvoj generaciji antihistamina difenilmetanske i piperazinske klase. On je prvi put sintetisan 1956. i u prodaji je bio od strane kompanije Pfizer u SAD-u iste godine. On je još uvek u širokoj upotrebi. ↑ 1,0 1,1 Paton DM, Webster DR (1985). „Clinical pharmacokinetics of H1-receptor antagonists (the antihistamines)”. Clin Pharmacokinet. 10 (6): 477—97. PMID 2866055. ^ Shorter, Edward (2009). Before Prozac: the troubled history of mood disorders in psychiatry. Oxford [Oxfordshire]: Oxford University Press. ISBN 0-19-536874-6. ^ H. Morren, U.S. Patent 2.899.436 (1959); H. Morren, DE 1049383 (1954); H. Morren, DE 1061786 (1954); H. Morren, DE 1068262 (1954); H. Morren, DE 1072624 (1954); H. Morren, DE 1075116 (1954). Shorter, Edward (2009). Before Prozac: the troubled history of mood disorders in psychiatry. Oxford [Oxfordshire]: Oxford University Press. ISBN 0-19-536874-6. Hutcheon, D. E.; D.L. Morris; A. Scriabine (1956). 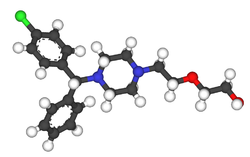 „Cardiovascular action of hydroxyzine (Atarax)”. J Pharmacol Exp Ther. 118 (4): 451—460. PMID 13385806. Dolan, C. M. (1958). „MANAGEMENT OF EMOTIONAL DISTURBANCES—Use of Hydroxyzine (Atarax®) in General Practice”. Calif Med. 88 (6): 443—444. PMC 1512309  . PMID 13536863. Anderson, Philip O.; James E. Knoben; William G. Troutman (2002). Handbook of Clinical Drug Data. McGraw-Hill Medical. ISBN 0-07-136362-9. Clark, B. G.; M. Araki; H. W. Brown (1982). „Hydroxyzine-Associated Tardive Dyskinesia”. Ann Neurol. 11 (4): 435. PMID 7103423. doi:10.1002/ana.410110423. RxList; et al. (2004). „Atarax Indications, Dosage, Storage, Stability”. RxList - The internet drug index. Архивирано из оригинала на датум 27. 02. 2007. Приступљено 9. 3. 2007. Medscape (2004). „Vistaril Oral: Monograph - Hydroxyzine Hydrochloride, Hydroxyzine Pamoate”. medscape.com. Приступљено 9. 3. 2007. Ова страница је последњи пут уређена на датум 12. април 2019. у 02:02 ч.